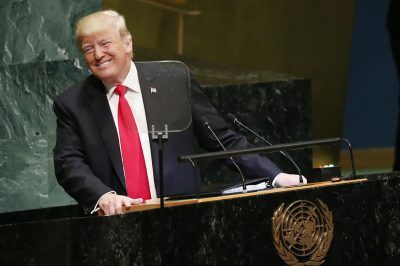 This past week Donald Trump appeared before the United Nations Assembly in New York. In typical Trump style, he immediately launched into bragging about his accomplishments. Like most of his recent public appearances, it was a campaign speech directed to his political base. He proclaimed to the Assembly he had achieved more in his first two years than had any other president in a like period. The claim elicited laughs from the audience, which Trump would brush off later in a press conference saying “We were laughing together, they weren’t laughing at me”. Sure, Donald. That’s what happened! In the course of his over-the-top, self-congratulatory announcement he said the US economy had grown faster in his first two years at the presidential helm than in any administration before during a like period, he had reduced unemployment to the lowest rate ever in the US, and his policies have produced record wage gains for American workers. The reality, however, is none of the above is true. Jack Rasmus is author of the book, ‘Central Bankers at the End of Their Ropes: Monetary Policy and the Coming Depression’, Clarity Press, August 2017, and the forthcoming book, ‘The Scourge of Neoliberalism: US policy from Reagan to Trump’, 2019, also by Clarity Press. He blogs at jackrasmus.com, hosts the weekly radio show, Alternative Visions, on the Progressive Radio network, and tweets at @drjackrasmus. He is a frequent contributor to Global Research.